Missouri tight end Albert Okwuegbunam (left) and quarterback Drew Lock could hear their names called early in the 2019 draft. COLLEGE STATION, Texas — Alabama set an SEC record with 12 players taken in the 2018 NFL draft, including four in the first round. The top-ranked Crimson Tide is sure to have several high draft picks in next year’s draft, too, but there are players at many other SEC schools who also are likely to hear their names called in the first round of the 2019 draft. According to several mock draft boards, the SEC could have first-rounders from as many as nine schools. Not surprisingly, the top-rated SEC prospect with two weeks left in the regular season is from Alabama. Offensive tackle Jonah Williams is picked by some to be drafted as high as No. 2 after starting all 39 games in his career with the Crimson Tide and earning All-America honors at left tackle last season. 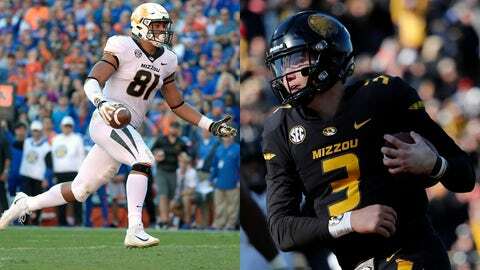 At Missouri, two offensive stars could be selected in the first round in 2019. Tight end Albert Okwuegbunam led the SEC with 11 touchdown receptions last season and is fourth this year with six TD grabs and has 466 yards receiving. His numbers are on hold, however, until he can return from a shoulder injury that will sideline him for a second consecutive week. Okwuegbunam’s quarterback, Drew Lock, could join him as a first-round pick after a four-year career in which he has thrown for 11,342 yards and 92 touchdowns with just 39 interceptions. Lock led the nation with 44 touchdown passes last season and ranks second in the SEC this year with 21 TD tosses. He has thrown for 2,647 yards, which also ranks second. Kentucky hasn’t had a player taken in the past two drafts with the Wildcats‘ most recent draft pick coming when Josh Forrest was selected by the Rams in the sixth round in 2016. Their drought should end this year with outside linebacker Josh Allen expected to be chosen in the first round. If he is, it will give the Wildcats a first-round pick for the first time since Bud Dupree was selected by the Steelers with the 22nd overall pick in 2015. Kentucky coach Mark Stoops isn’t shy about bragging about his star player and called him the “best defensive player in the country” on his radio show last month. Allen, a senior, leads the SEC in tackles for losses (16) and sacks (11) and his five forced fumbles lead the nation. The 6-foot-5, 260-pounder has 65 tackles and has recovered two fumbles. Mississippi could have two first-round picks in offensive lineman Greg Little and wide receiver A.J. Brown. Both are projected to be top-25 selections. The Rebels entered the season with three first-round prospects, but receiver D.K. Metcalf could choose to return for another season after suffering a season-ending neck injury that required surgery last month. Brown’s 72 receptions and 1,047 yards receiving both lead the SEC and he’s had five 100-yard receiving games this season, including three in a row. The 6-1, 225-pounder became the school’s all-time leading receiver in a loss to Texas A&M on Saturday. He has 2,711 yards receiving to move in front of Shay Hodge, who had 2,646 yards receiving from 2006-09. Georgia, which had three first-round picks in the 2018 draft, could have another one next year in cornerback Deandre Baker. He flirted with the draft last offseason before returning for his senior year. He has two interceptions and leads the SEC with nine passes defended. With two of the best defensive linemen in the nation, Mississippi State could have two first-round draft picks. Jeffery Simmons, a 6-4, 300-pound tackle, is a three-year starter whose 12½ tackles for losses rank fourth in the SEC. Simmons has 27½ tackles for losses and five sacks and has piled up 148 tackles in his career. Defensive end Montez Sweat led the SEC with 16 tackles for losses and 11 sacks last season. This year he is fourth with 13 tackles for losses and second with 10 sacks. Defensive tackle Derrick Brown could be the first player from Auburn taken in the first round since the Tigers had two in 2014. 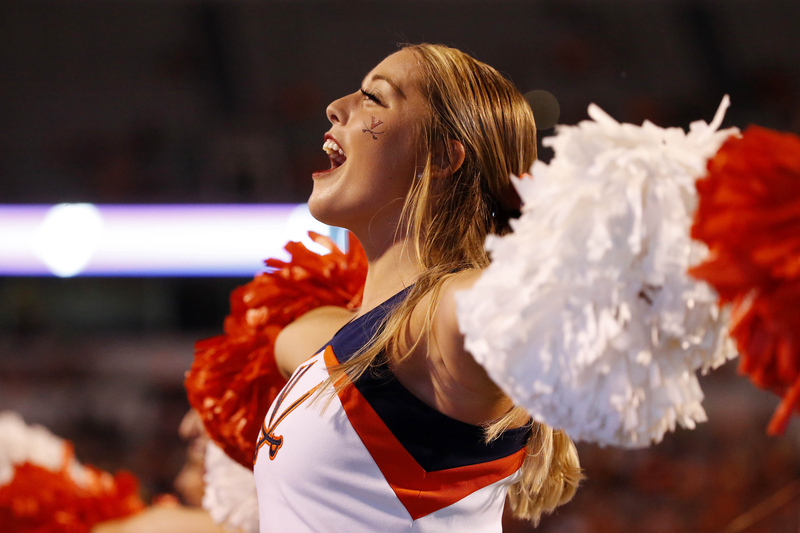 Brown has 9½ tackles for losses and 3½ sacks this season and has 20 tackles for losses and eight sacks in three years at Auburn.